I’m a member of the internationally renowned Clandestine Cake Club and regularly go along to local events in Yorkshire. I’ve been a member for over 3 years now and have made a lot of friends through the club. We take a cake each along to the event and try tiny pieces of each other’s cakes. If we can’t eat much, we take cake home at the end to share with family or work colleagues. Last year I was excited to hear that two of my recipes were to be published in the second Clandestine Cake Club cookbook “A Year Of Cake”. My Welsh Honey and Camomile Bara Brith and Mojito and Coconut Tres Leches Cake recipes were featured in the book, much to my surprise but happiness! Lots of yummy recipes are featured in the book including ones created by friends. 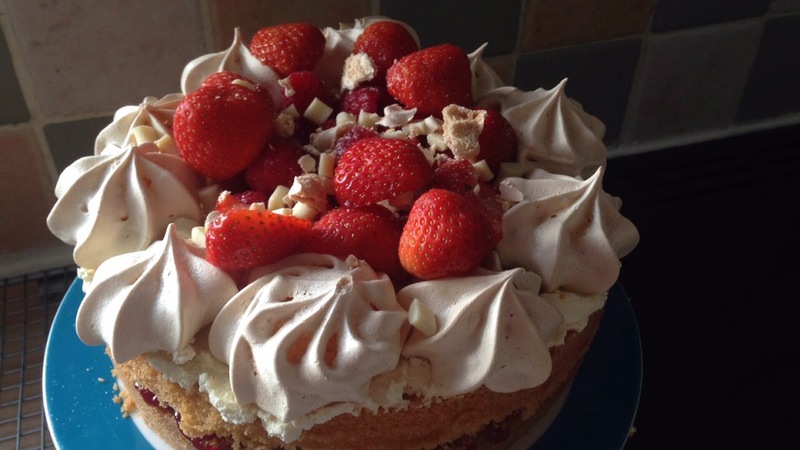 One such recipe I’ve been desperate to have a go at baking is the one my friend Clare submitted for the book, her take on a British classic pudding in cake form- Eton Mess. Containing some of my favourite pudding ingredients, such as meringue, strawberries and raspberries mixed with cream. Clare’s cake uses buttercream and jam to sandwich a traditional Victoria sponge together and the Eton Mess part of the cake is it’s photogenic topping. Clare’s recipe also contains another ingredient I love which works perfectly with strawberries and raspberries, a luscious addition of white chocolate chunks. Last Saturday afternoon I was at home for once. It’s been a crazy few weeks with every weekend spoken for and work has been chaotic. Baking was my chance to unwind and enjoy a bit of “me time”. I wanted to bake a cake to celebrate my daughter passing her college course. She is now a qualified make up artist and is off to uni to study media makeup and prosthetics in September. We are all very proud of her as she aims to follow her dream. Baking cakes of course is one of my ways of congratulating her! 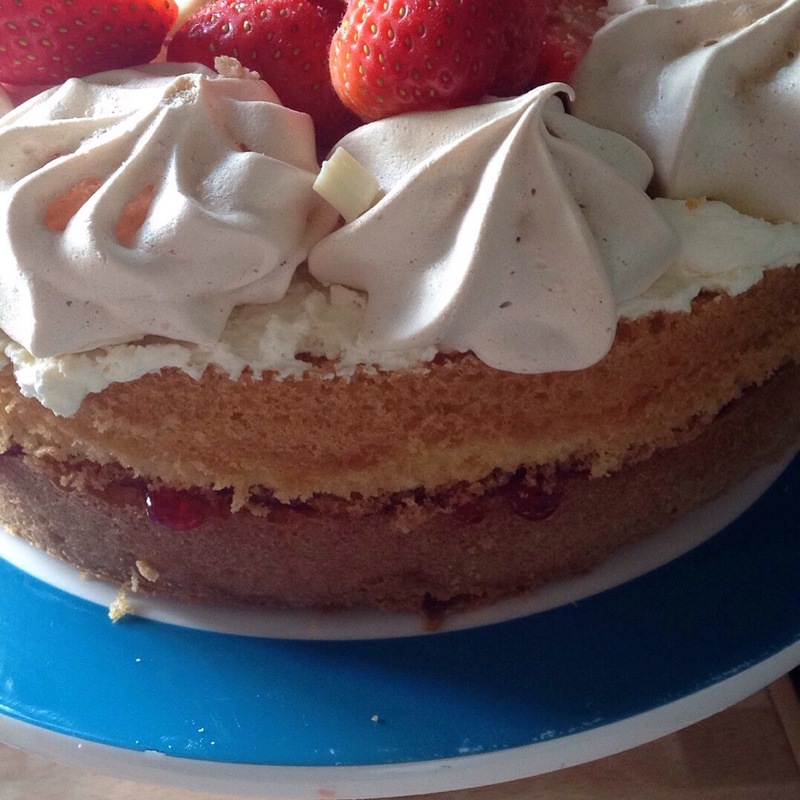 Everyone at home loves pavlova and cake so I knew the Eton Mess cake would be a big hit. To bake the cake I started off by baking the sponge part. This is done in the usual way that you make a Victoria sponge and it wasn’t long before I was creaming butter and sugar together with my handheld electric mixer. Clare suggests using margarine instead of butter so I used Pure Non Dairy spread which I swear by for baking sponges and cupcakes. It makes them very light. Then in went four eggs one by one which were beaten into the mixture. As I started to add some self raising flour and baking powder I realised I hadn’t got the cake tins out. My cake tin drawers in my kitchen are getting very messy and it takes me ages to sort through them to find the right size tin. I was annoyed that one of the tins had fallen down the back of the unit and got wedged between it and the drawer below. Hubby would say it was my own fault for having too many cake tins! I don’t agree! Finally having found the tins I was looking for I got them greased and the mixture in them ready to go in the oven. For once I remembered to set the timer and being as I have a fan oven I wanted to check them after 20-25 minutes. This is when I realise I’m not that good at multi tasking. I put some washing in the machine and another load out on the line. It took me ages to do this as there were loads of pairs of socks and pants to hang out! By the time I’d gone back inside I realised it was time for the cake to come out of the oven. Thankfully got it out just in time! Now for the decoration part. For the cake topping I needed to make some mini meringues. 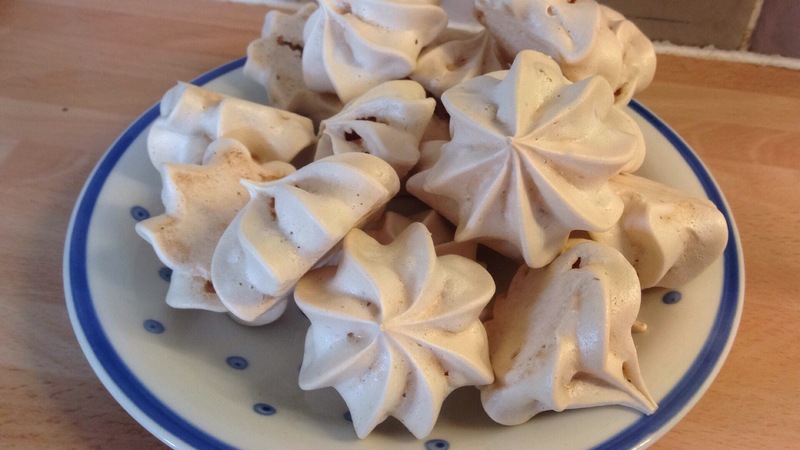 I’ve only made meringues once or twice before, it’s something I’ve never really done a lot of. I always thought of them as being fiddly and complicated. But Clare’s way of whisking the egg whites until they are stiff then adding caster sugar a teaspoonful at a time was a great help to get the right consistency. I have always tipped in the sugar and wondered why I couldn’t get them to keep the egg whites stiff enough. Also, to add into the meringue mixture you mix in some cornflour and white wine vinegar. 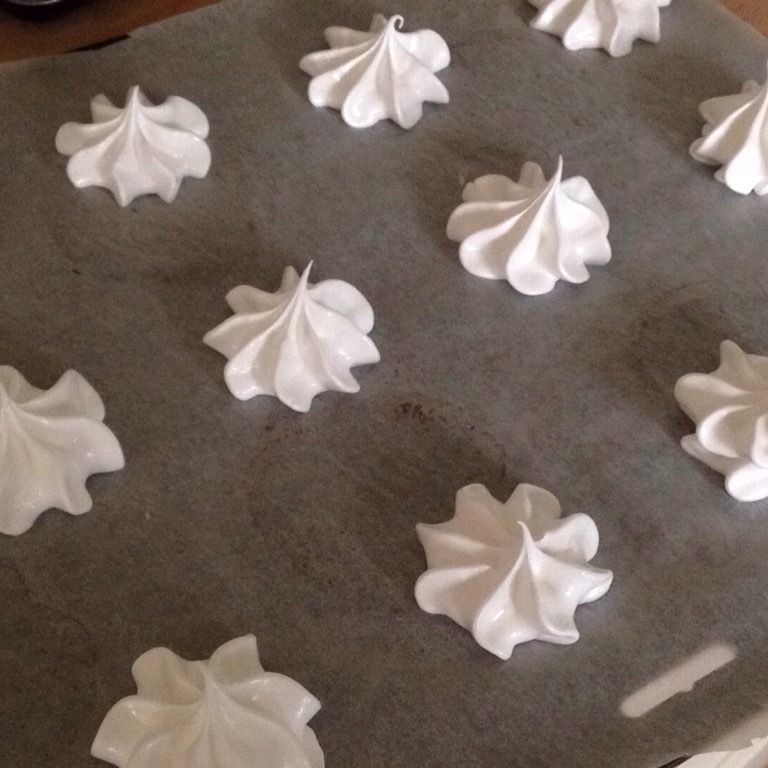 I was impressed with my shiny meringue mixture and then got my baking trays ready. I prepared up my piping bag and my large star nozzle. The meringue piped easily onto the trays and there was more than enough to go on the cake as well as having some left over. I was really impressed with how my meringue stars turned out. There were lots of leftover meringue stars once I’d decorated the cake. Now for the cake assembling and decorating time, the bit I was looking forward to the most. I decided to use whipped cream in place of buttercream in the recipe. I had a small pot of cream in the fridge which needed to be used up and I didn’t want to waste it. I whipped up the cream but there wasn’t enough to fill the middle of the cake along with some strawberry jam. So instead the cream was just spread on the top of the cake with the jam in the middle. 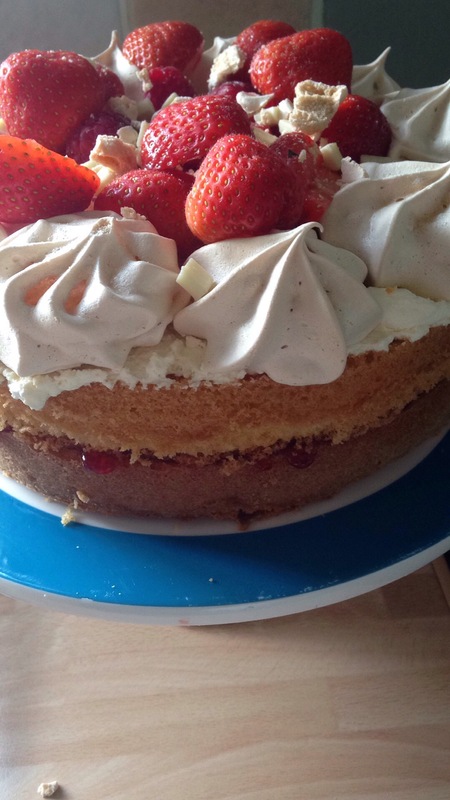 Once the cream was spread on I put meringue stars around the edge of the cake and filled the middle with raspberries, strawberries and white chocolate chunks. 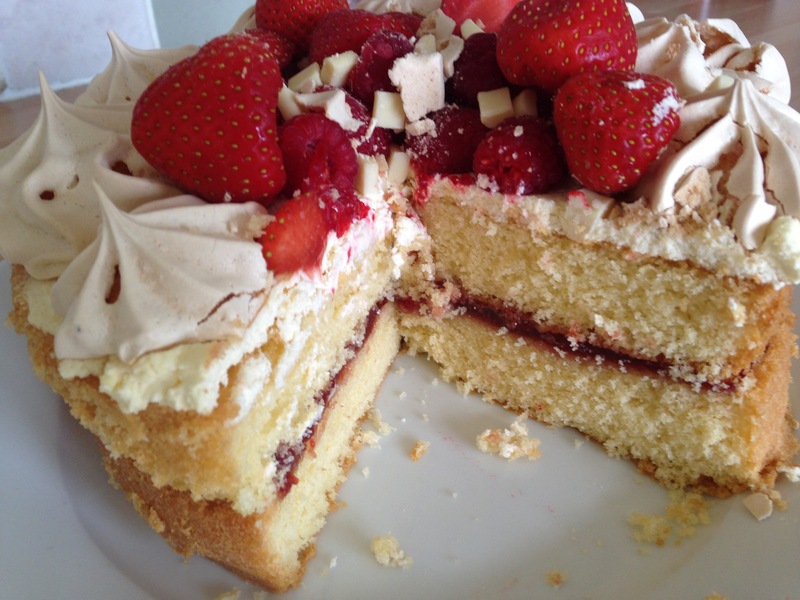 View from the top- a heavenly combination of meringues, raspberries, strawberries, cream and white chocolate. Ta-dah! A classic cake perfect for a summer celebration. We didn’t get to eat a piece of the cake until the following day but it was worth the wait! The cake got eaten over the next couple of days. By Wednesday it had all gone! Although the cake had been baked on Saturday afternoon for my daughter, we didn’t actually get to enjoy some until the day after. My daughter had been working all day Saturday and went straight to a friends’ house to a party and sleepover. Then on Sunday morning she went straight to work and didn’t get to eat her cake until Sunday tea time. I kept the cake in the fridge due to the cream in it and it kept it fresh. 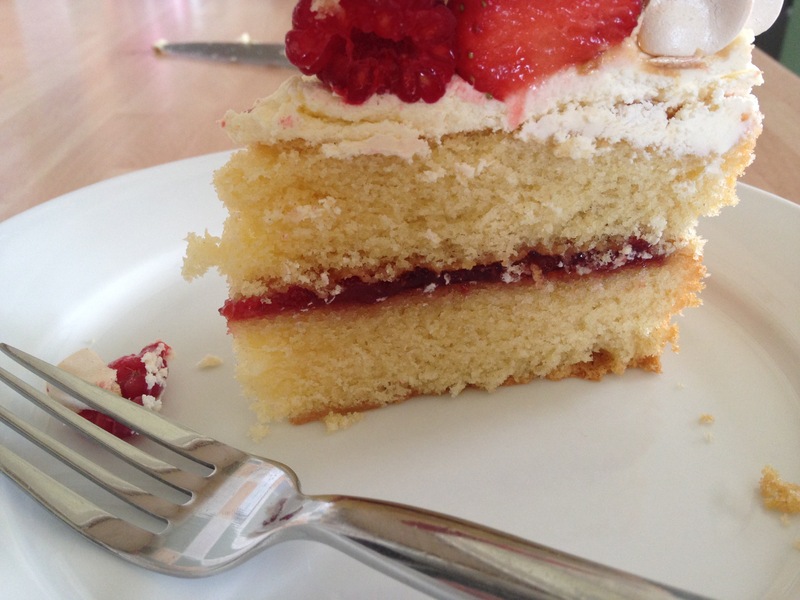 An extremely popular cake all round and one I would love to bake again in the future. Previous Post Couch to 5K- My Story. Next Post Wet Wet Wet Live At Royal Hospital, Chelsea- A Review.